Michael Kors has become the new Coach. Coach sadly had a vast fall in sales, blatantly because of the lack of status and quality that was being produced. Coach became owned by almost every individual and therefore lost its lack of appeal to consumers. 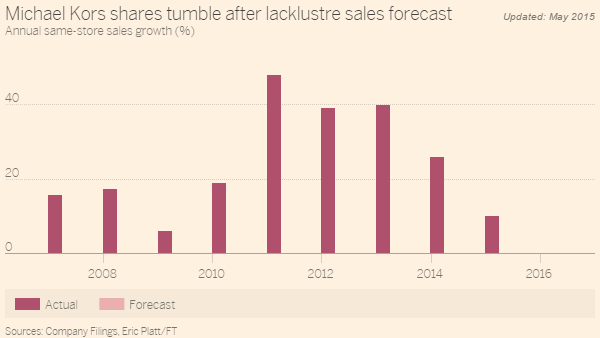 Michael Kors has been experiencing the same downfall in the past six moths. The bags have become a universally owned product and consumers are not smitten over the brand. Recently Michael Kors has experienced a $4.9 million dollar lawsuit. Consumers have been complaining about the quality of merchandise in the Michael Kors outlet stores says the fashionista.com article. The tags on the products will state the retail price of an item at $120 and the actual price will be $79.99. Now this would be completely fine if the products in the outlet were of the same quality as the actual store product sold at $120. Michael Kors has been making replica products with cheaper quality materials so that they can market the product as marked down from its original price, but it was actually produced at a lower cost to begin with. Outlet stores in general can be deceiving to consumers. It is best to shop the sale racks at the actual luxury brand stores than at an outlet store. There is talk about changing the tags, showing the “retail price” as the “value” instead says the Pop Fashion Podcast. This will give consumers a better idea of the actual quality they are receiving. It is sad to see Michael Kors lose their lack of allure and sense of luxury. First it was the downfall of Coach and now MK. If I were to make a prediction I would say that MARC by Marc Jacobs would be the next popular luxury handbag for consumers. If you would like to jump on the bandwagon early, and if you believe my prediction makes sense, here are a few bags that I am lusting over. Of course maybe you already own one as well. You and I are on THE same wavelength! I’ve said that about Marc Jacobs as well. Either way the whole idea of luxury, status and individuality is silly. I say find yourself a quality leather bag that you love for the style and quality, not the name. lol completely the same wavelength, thanks Sam!